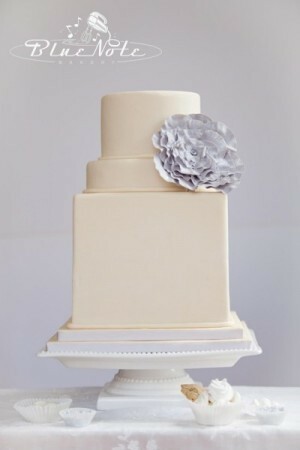 Simplistic Elegance shown in this wedding cake using various shapes and heights in the tiers. Add a flower accent using a color matching with your wedding color theme. Can’t finish all that cake? Add fake tiers to make your cake look pretty! Envy Cake is here to help you doing all we can to create your perfect wedding cake. We create wedding cakes that will wow your guests! This cake is created by Blue Note Bakery Inc.